For a variety of reasons (work stuff, weather stuff, & personal stuff), it's been a rough couple of weeks. Hell, let's be honest, here: it's been a rough couple of months, and I think a lot of librarians might agree. Well. I don't mean to brag, but that says Librarian of the YEAR, you guys. This ain't no flavor of the month nonsense. Now, the girl wasn't sure how to spell my name - "Reeda? Reeta?" - so another kid who was standing at the desk filled it in. I was very touched to receive this prestigious award, even when the girl said: "Next year, it will probably be Ally" (my awesome co-librarian, who I'm sure would have gotten this piece of paper herself if she were the one who happened to be there at that moment). THEN, a different girl, who was also standing by the desk (there are usually about five or six of them at any given time), gave me a drawing that she had been working on for a few minutes. What a special day! 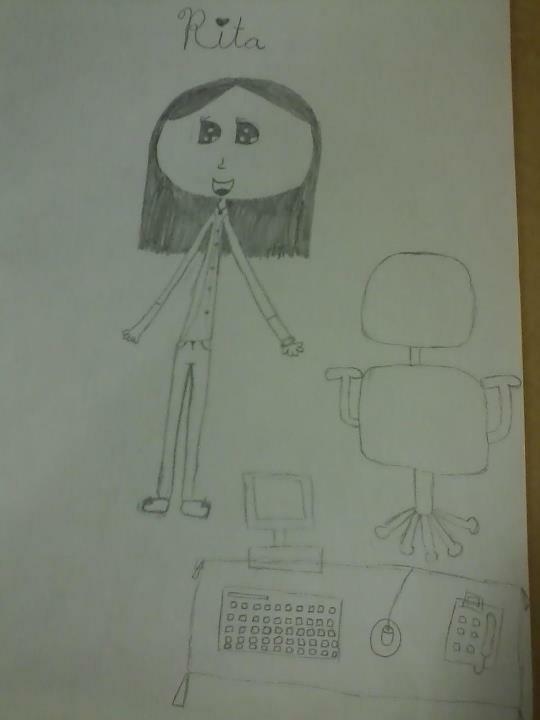 This particular kid has given me similar drawings before (and I try to ignore the fact that she must find my head massive), but this time she added the reference desk to the picture and told me "I wanted to draw your desk because I know it's important to you." *Actually, it was exactly a year ago TODAY that I transferred into this particular branch. Happy Libraversay to me! not a massive head, a skinny librarian. Embrace it. Based on that picture, you have great hair. Congratulations! And don't fret over the head: kids draw huge heads on everyone, I think. If your head was drawn normal size, I would worry. 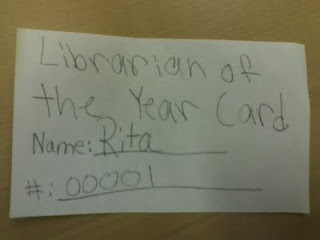 I like that you're Librarian of the Year #00001. You are the FIRST! Happy Libraversay to you Librarian of the Year! Who needs LJ Movers and Shakers when you are awarded that kind of kudos. Good one! What a great pick me up after a not so great summer. Congrats, Rita--Librarian of the Year!! Thanks, everyone! I've put the award on my bulletin board, where I can look at it if I ever need a pick-me-up.